I walked out of my apartment yesterday and was greeted by thousands of butterflies. After admiring them for a while, I grabbed my camera and took dozens of photos. 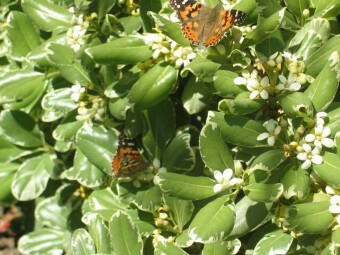 Many of my photos were blurry due to the camera auto-focusing on bushes rather than the butterflies on the bushes. I don't know whether my camera has a manual focus feature. In October 2002, I won a $750 Amazon gift certificate in AllTheWeb CSS/design contest by abusing CSS. I used XBL bindings (a Mozilla extension to CSS) and HTC behaviors (an IE extension to CSS) to add keyboard shortcuts. Last month, I used some of the gift certificate to buy a digital camera. Leonard Lin pointed me to Imaging Resource, which helped me choose between the 8oz Canon PowerShot S400 and the 4oz Pentax Optio S4. (dcresource also has useful reviews of an earlier version of the Optio and the Canon PowerShot S400.) Even though experience tells me that I'll carry around a 4oz device (Palm V) while I won't carry around an 8oz device (Sony Clie), I bought the Canon because its image quality is a lot better. The camera arrived last week. I will post some photos as soon as I stop running my finger around the rim of the closed lens while muttering "precious" figure out how to make thumbnails.